Do the health hazards of drinking impact your alcohol intake or how you counsel clients? Here are some thoughtful responses from Fitness Journal readers. In our September 2018 issue of Fitness Journal, we reported on an international study published in The Lancet that found any level of drinking above 100 grams of alcohol (3.75 ounces) per week increases heart disease risk and shortens lifespan. Are you considering scaling back your intake [of alcohol]? Do you counsel clients about the risks of drinking as part of their overall health program? Do you think an active lifestyle can diminish some of the negative consequences of light drinking? Thank you for sharing the increasing evidence for the risks associated with alcohol consumption. I have been a fitness professional for over 25 years and am a 20-year breast cancer survivor (cancer was caused by estrogen replacement patches). I have never consumed alcohol. With the evidence still growing about the association between even small amounts of alcohol and breast cancer risk, I am very concerned about the number of women drinking large amounts of alcohol. The book [by Gabrielle Glaser] Her Best Kept Secret (Simon & Schuster 2014) reveals how alcohol has been systematically marketed to American women and how women are going to extremes to hide their excessive consumption. As a 70-year-old healthy fitness professional who has no health problems, still runs for 75 minutes at least 5 days a week, and lifts weights, I will continue to abstain from alcohol. Thank you for getting the research out there so we as trainers can give factual information to clients. Thanks for including such an interesting topic this month! To answer your questions, first, I'm not a daily drinker, so I will continue to have a glass of wine or two a couple or more times per week. Sometimes weeks go by and I haven't had any wine. When I discuss nutrition with my clients, I've already reviewed their health history. For my clients who are apparently healthy and ask if they should cut out a drink with dinner, my usual response is one glass every now and then is fine—and I promote a healthy balance so they don't feel deprived. I only give my opinion if I see it logged on their food journals or they ask. First, I'm really not sold on the fact that light drinking has the negative consequences that these studies are indicating. Referring to light drinking, I believe an active lifestyle, as well as a healthy diet, can improve any possible adverse effects alcohol alone may cause; however, a person's health history, stress level and environmental factors all have a cumulative effect on life expectancy as well, so you really can't say that alcohol alone would be the sole reason someone is more susceptible to cancer. Before I read through the studies and in only reading your article, my initial reaction was that it really depends on the individual person and their current health status and health/family history—again, pertaining to light drinking. The statement regarding “no safe level of alcohol consumption”—part of the international study published in The Lancet: That statement was made by the UK's chief medical officer in an attempt to reduce “alcohol related harms.” Makes sense to me since the UK offers affordable public healthcare. Regarding the study done at Washington University's School of Medicine (disclaimer, they received a grant from the National Institute of Alcohol Abuse & Alcoholism), the data emphasized “daily” drinking as the cause for increased cancer risk. It also showed that drinking one to two drinks four or more times per week “seemed to protect against cardiovascular disease,” but drinking daily “eliminated those benefits.” This was a population study. Therefore, the data isn’t able to help assess a person’s individual risk of mortality related to daily drinking. That pretty much contradicts the overall message of the study, doesn't it? What populations did they actually study? They really didn't go into detail other than age and stating a portion of the data was from VHA medical records (I would imagine there is a higher risk with that group). Last, I want to point out that Spain, Italy and France are among the countries with the longest predicted life expectancies by 2040. People who live in these countries are known to drink wine regularly with meals, so maybe it's the type of alcohol that should be factored into research as well. I have been an exercise physiologist for the past 29 years. I have worked primarily in hospitals and clinics. The last 12 [years] . . . I have spent working in the state psychiatric hospital. As most probably know, exercise is a wonderful modality to help those with mental illness. In regards to alcohol usage, the question is why? Why would anyone want to poison themselves? Yes, alcohol is metabolized as poison in the body. It has absolutely no nutritional value. It ruins just about every organ in the body. Number one organ to be addressed is the brain. It negatively affects the digestive track, the liver, the pancreas and the heart. It raises blood pressure and is a carcinogen. It causes mental illness. What we hear is that alcohol is acceptable in moderation. However, when one starts consuming, judgment is immediately impaired, so decision-making is impaired. The ability to determine if a moderate amount is acceptable cannot be accurately determined when thought processes are impaired. What is the reason to put poison in the body and impair thought processes? Is it to relax? Exercise professionals can teach clients and themselves to naturally relax with breathing techniques and mind-body forms of exercise. As health and exercise professionals promoting wellness, alcohol is not necessary and has no health value. Visit a mental health hospital and view the ravages of alcohol usage. Why not learn to deal with emotions healthfully and not put poison in the body and the mind? I took a break from alcohol after the holidays, mainly because I gained 8 pounds from Thanksgiving to New Year. While I haven’t lost much weight yet, I have noticed how much better I am sleeping. Also, I’m getting through my early workouts with more energy and stamina. I think as you get older, an active lifestyle can’t really diminish the negative consequences of alcohol. Younger clients might be able to get away with it more. I also think you lose a lot of time when you might be hampered by a hangover. Life is too short. Needless to say, I’m also saving a ton of money. With all the data I think it is time for us to put the glass down. 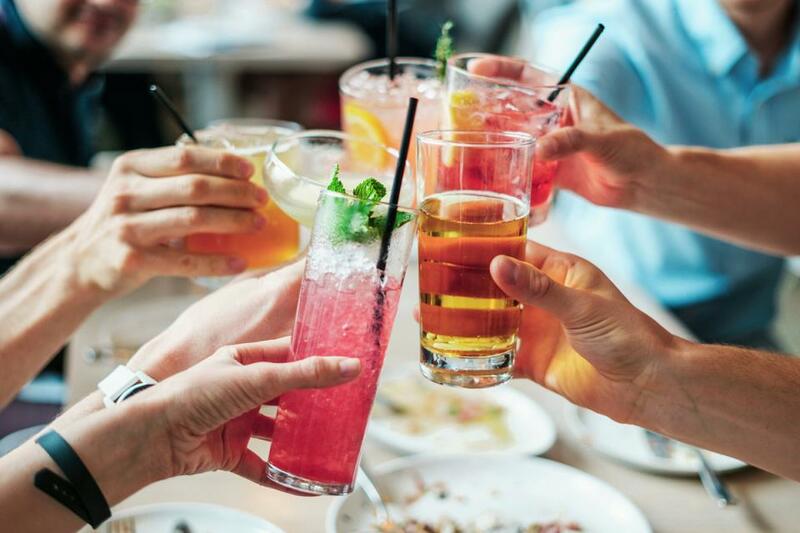 As fitness and nutrition experts, we push the benefits of eating food closest to its true form, yet many say moderate drinking is okay for health benefits. Why not go straight to the source and just have grapes? Just as you can’t outrun a bad diet, you can’t out-exercise a cocktail. Where do you stand on alcohol consumption? Please weigh in by adding a comment below.